USPC would like to highlight the National Youth Board Members for the current term. Today we would like to introduce Tanner Kooistra. Tanner Kooistra is a C-2 Trad member of the French Creek Pony Club in the Northwest Region. She currently attends Ocean Research College Academy (as a high schooler) and plans to move to the University of Washington and obtain a major in Material Engineering. When Tanner is not studying, she enjoys hanging out with friends, jet skiing, swimming, and riding her horses. 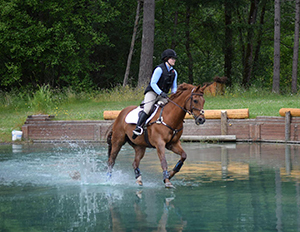 Ever since she started riding, she has been an avid eventing competitor. Over the years, Tanner has been a working student for local trainers, participated in Lendon Gray’s Dressage 4 Kids program, and has traveled the West Coast Circuit. When she joined Pony Club, she started in Tetrathlon and has been to Championships every year since. Her favorite thing about Pony Club is all of the friends she has made around the nation, and re-visiting them at Pony Club functions.